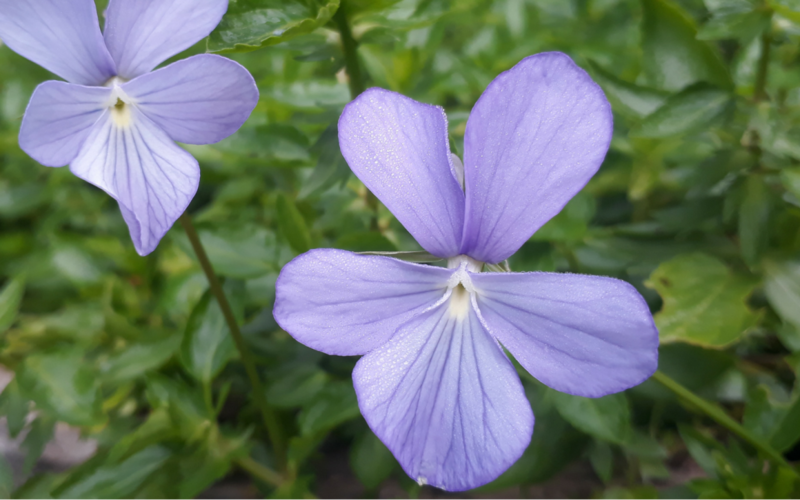 Still looking beautiful as summer slides into autumn, the long flowering Viola cornuta is a small (up to 15cm), but tough, border plant . Its clear blue flowers start in late spring and continue all the way through to September. It performs well in sun or shade, can spread up to 40cm and has evergreen leaves; making it great front of border or edging plant. To get the best out of this plant deadhead regularly to encourage more flowers. The common form has blue flowers but you can also buy hybrid varieties such as the white Viola cornuta ‘Alba’. 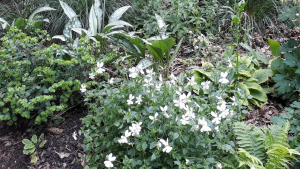 Below you can see the white variety in a shady planting with silver-leaved Pulmonaria ‘Diane Clare’, Euphorbia and ferns. More ideas on plants for shade. The specialist mail order Plant suppliers below usually have Viola cornuta in stock and both have good quality plants.